SHANGHAI, April 17, 2019 – Galleria Art Center, Jiahao International Holdings most renowned wedding club, recently held its 2019 annual gala in Shanghai. Popular singers, veteran actors, business leaders and fashion celebrities gathered together to put on a fantastic show for the young audience. A leading player of the wedding industry in China, Jiahao International Holdings has tapped into a range of sectors related to culture and fashion, enhancing the brand’s appeal to young people. “We are not merely making weddings happen. We are creating fantasies and dreams for the young in China and making their dreams come true. Through romantic fantasies, young people show their aesthetic values and lifestyle choices,” said Allen Shi, Founder and Chairman of Jiahao International Holdings. The young, passionate and visionary Allen Shi has been dubbed “the Godfather of China’s wedding industry.” He has tapped into the growing demand for western-style romance in China and brought innovative and bold energy to it. To make weddings more personal, special and unforgettable, Allen Shi has travelled around the world to learn about the wedding industry and returned very inspired. The entire wedding experience produced by Jiahao International Holdings, including the pre-wedding photo shoots, is fun, tailor-made, topnotch and set in an exotic background. Aimed at high-end consumers, its wedding services, especially pre-wedding photography, are delivered with top standards in every detail, including hair and makeup artists, stylists, photographers, shooting backgrounds, cosmetic products and accessories. To achieve that, Jiahao International Holdings has cooperated with a wide range of luxury brands around the world, including Chopard and Jimmy Choo. Aided by new technologies, Jiahao International Holdings provides unique and immersive experience for weddings. With location changes brought through 4D multimedia technology, the dream of having ceremony in Paris and dinner party in Hawaii comes true. The Galleria Arts Center is the one and only wedding studio in China that offers island-themed wedding services. The Galleria Arts Center creates an authentic presentation of the St. Laguna Chapel in Guam, one of the most popular wedding destinations in the world. It also offers one-stop services including yacht parties and ceremonies at musical halls. Allen Shi calls the business they are involved in “the “happiness industry.” In 2018, Australian filmmaker Olivia Martin-McGuire made a documentary about the pre-wedding photo shooting industry in China, titled China Love. Allen Shi is featured as a major player of the industry in the documentary, as what he has done is not merely reshaping the industry but creating a new one. For Allen Shi, pre-wedding photography is just part of the “happiness industry,” which is a holistic industrial chain providing products and services appealing to all the needs related to a wedding. Tapping into the booming “love economy,” Allen Shi and his company are committed to expanding their business across the global landscape, creating fantastic wedding experiences and sharing the most important moment of one’s life with people around the world. “We hope people can have a romantic wedding of their own. That’s our dream,” said Allen Shi. A crucial part of making the Group’s “happiness industry” a global one, according to Allen Shi, is talent nurturing. The Group has been seeking partnerships with institutions across the globe to set up programs specifically for the wedding industry in the areas of photography, costume design and others. “We hope that more creative and professional talent will bring new energy to the traditional wedding industry, drawing on the experience of creating fashion shows and luxury lifestyle events. Starting with that, we are building an ‘ecology’ for the wedding industry,” said Allen .Shi. Jiahao International Holdings brand portfolio includes over 20 renowned wedding studios such as the Artiz Studio from Korea. The Group has set up over 200 physical stores around the world, offering unique and top-notch wedding services. Founded in 2008 in Shanghai by Allen Shi, Jiahao International Holdings is committed to the development of global cultural industry with the vision of reshaping the wedding industry. It is now engaged in a range of businesses, including the cultural and fashion sector, education, pre-wedding photography, wedding dresses, jewelry, hospitality, finance and industrial properties. The Group has built an industrial chain and has been expanding its business across the globe. It has set up many branches in the USA, France, Korea, Singapore and Malaysia. 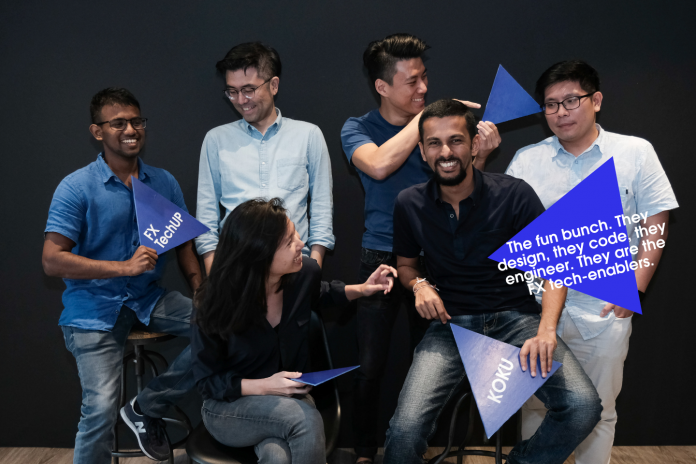 19/4/2019 – Koku, a Singapore-based fintech that focuses on foreign exchange (FX) has announced that it raised a US$2 million pre-Series A funding. The round was led by Jason Zeng, the co-founder of Tencent Holdings who had also founded Chinese angel investment company Dencent Capital. The newly raised capital, according to Koku, will be used for product development and regional expansion to neighboring Southeast Asian countries including Indonesia, Vietnam, Cambodia, and Myanmar. The company will also use it to invest in expanding and growing its FX TechUP Suite to offer artificial intelligence technology and machine learning that will utilize data for users in the ecosystem. Koku is a platform that works with non-bank financial intermediaries, including remittance companies and liquidity providers in Singapore, Hong Kong, and the Philippines. Its FX TechUP suite enables wholesale trading of currencies between licensed liquidity partners screened and on boarded by Koku. This allows liquidity providers to conduct on-demand settlement to provide cheaper, quicker and digital-first remittance services to their customers. Besides, the suite also features a white label remittance solution for businesses to add or build digital remittance offerings such as e-wallets. “With our expertise in tech-enablement, paired with their industry expertise, we’re able to save on cost, time and risk management. As our customers aren’t burdened with the responsibility of ensuring the technology works, they are able to focus on providing for their customers,” said Koku’s CEO and Founder Calvin Goh. The immediate plan to execute would be improving the technology for non-bank remittance and liquidity providers that it believes will push their business further for the next six months. The company aims to increase its transaction volume from its current US$10 million a day to US$30 million. To accomplish this, Koku will also be seeing a boost in headcount by 30 percent over the next six months. A recent report by the World Bank states that the remittance sector in 2019 will grow to 4.2 percent from US$142 billion value estimation in 2018 in East Asia and Asia Pacific alone. By tech-enabling businesses in the region with technology, there’s an opportunity for Koku to capitalise on the increase in cross-border transactions, digital remittance and financial inclusion. “We are aware that the non-bank remittance and liquidity power service is a complex business model that requires hard work. But it will be rewarding if we can provide the same facility to these underserved groups and help them in their operations,” said Goh. Commenting on the deal, Chris Cao, Vice President of Decent Capital’s Angel Investment Department said that Koku is the first company in Singapore that their founder Jason Zeng has invested in since co-founding Tencent. Moving forward, Koku said it expects to raise US$10 million in a Series A round during the next couple of months. “We’ve created a lot of curiosity and interest within the industry because of this. With the amount that’s secured in this round of funding, we’re confident that we’re in good standing to further develop our offerings and expand into new markets as we move towards Series A,” Goh added.